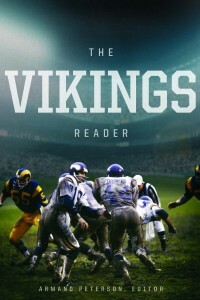 We’ve recently been promoting The Vikings Reader by Editor Armand Peterson. We’ve even given you a chance to win a free copy of your own. Today, I got a chance to ask Mr. Peterson some questions about himself and the book. Please enjoy the interview and check out the book by clicking here. Mr. Peterson, thank you for giving us your time. First thing is first, I love The Vikings Reader. What inspired you to take up such a challenge? I wish I could claim that the original idea for the book was mine, but it came out of discussions with Pieter Martin of the University of Minnesota Press. Pieter was the editor of a book I co-authored about Minnesota amateur baseball (published in 2006). He had been thinking about publishing a book about the Vikings and asked me if I would be interested in pulling together an anthology-based history of the team. The idea immediately excited me—first, I am a Vikings fan, and second, I enjoy researching in old newspapers and magazines. I was a little concerned about the chances for success of one more Vikings book—written, after all, by someone not well known in the local football community. However, I was encouraged after looking at the competition. Bookstore shelves are full of books about the Vikings, but most are biographies or autobiographies, photo books or recollections by local sports writers. It seemed to me that there was room for a book that looked at Vikings history from the viewpoint of a fan—and someone with no particular axe to grind. In other words, the kind of book I like to read. Tell us a bit about who you are and your experience in sports and writing. I’m a retired engineer and manager who worked his whole career at Honeywell and Alliant Techsystems. (Honeywell spun off its conventional defense business as Alliant Techsystems in 1990.) I’ve been an avid sports fan all my life. A childhood bone disease prevented me from playing football, but I played a lot of baseball in high school and for several years on the Hector town team. I try to keep in shape these days by bicycle riding and taking an occasional jog. Consequently, I can play a rotten game of golf without getting tired. I grew up listening to Minnesota Golden Gophers football games on the radio and cherished the few times I actually got to see a game at Memorial Stadium. I became an NFL fan while watching grainy black and white telecasts in the 1950s. Bobby Layne, Doak Walker and the Detroit Lions were my favorites. I also liked the San Francisco 49ers, who featured ex-Gophers Leo Nomellini and Gordy Soltau, and glamour-boy running back Hugh McElhenny (soon to become an expansion draft choice of the Vikings), but their games weren’t broadcast in Minnesota very often. I became an instant Vikings fan in 1961. My wife and I had Vikings season tickets in the late 1960s and early 1970s, but dropped them when raising three daughters made it difficult to get to the games. The Vikings Reader is my second book. I co-authored Town Ball: the Glory Days of Minnesota Amateur Baseball with an old junior high school friend in 2006. (It was also published by the University of Minnesota Press.) I also contributed biographies of Wes Westrum and Jerry Koosman to Minnesotans in Baseball, a collection published in 2009 by the Halsey Hall Chapter of the Society for American Baseball Research and Nodin Press. The thing I love most about the book, is that it is practically a complete team history, but doesn’t have the corporate spin you would expect. What goals were you trying to accomplish by writing the book? My objective was to present an impressionistic history of the team—from a fan’s point of view. I didn’t want it to be a shameless team promotion, or a muck-raking exercise. And I didn’t want it to be a retrospective look at the team. You know that kind of book, where the author laments the fact that modern athletes are coddled and lazy, or argues that today’s athletes are so much more skilled, or whatever point of view he currently has. I merely wanted to recreate the atmosphere that existed for fans at the time. The book goes beyond a game-by-game or season-by-season summary of team history. Hopefully, by using contemporary newspaper and magazine articles as sources, I could help readers understand how fans actually felt back at the time the events took place. As the editor, my job was to get out of the way and let the reprinted articles tell the stories. The book contains many stories about the big games in team history, but, as your readers understand, there is much more to being a Vikings fan than watching the games. Therefore, many of the stories in The Vikings Reader talk about experiences that might not appear in most Vikings histories—attempts to pirate television signals from Des Moines to watch blacked-out home games; squabbles over games scheduled on Christmas; tailgating at the Met; Les Steckel’s Ironman Competition; ownership disputes; the decision to replace the St. Louis High School Parkettes with the Vikings own cheerleaders; Benchwarmer Bob commercials; players’ strikes; an accidental hot air balloon ascension; roller skating cheerleaders; team-building at the Pecos River Learning Center; and many more. There are 92 reprinted articles in the book—64 from newspapers, 17 from magazines, and 11 selections from 8 different books. Most of the newspaper articles are from local sources, and by sportswriters familiar to Vikings fans. Stories from newspapers like the Los Angeles Times and USA Today and national magazines help put the local stories in perspective. Who all did you meet while doing your research? Any good stories there? Probably not. The anthology format placed me in the position of looking for published material, and I did not interview any current or former players or Vikings beat writers. I am grateful for the support of writers like Jim Klobuchar and Bill McGrane, and publishers Paul Piper, Ross and Haines, and Sports Publishing LLC, as well as The Sporting News, who permitted me to reprint copyrighted material with no fee. If this were in fact a fictional novel, who would be the most interesting character? I am going to cop out on this question and give you three names—Fran Tarkenton, Alan Page and Dennis Green. Tarkenton’s scrambling and play calling made the expansion team competitive in the early years. When he returned in 1972 after five years with the New York Giants he led a strong team to the Super Bowl in three of four seasons from 1973-1976, but was often criticized because he didn’t win “The Big One.” Page was a reluctant hero who was one of the best defensive linemen in NFL history. (The only one to win the NFL Most Valuable Player award.) He was not satisfied to be remembered as merely an athlete, and his post-football career as a lawyer and State Supreme Court Judge has arguably surpassed his fame and accomplishments as a football player. Green was a controversial coach from his first day on the job. His ten-year 0.610 winning percentage just trails Bud Grant’s 18-year 0.622 record, but he never endeared himself to Vikings fans like Grant did. Which team throughout Viking history was the most interesting to explore? I lived in Illinois from 1985 to 1990, and enjoyed learning about the early days of the Jerry Burns era—when I was forced to view the Vikings through Mike Ditka’s lenses. That was perhaps my most interesting research. But the 1969 Vikings are my favorites. That’s when the team burst into the ranks of the elite teams in the NFL, and when I had season tickets. If I were 30 years younger, my favorite team would probably be the 1998 Vikings. I think that’s natural—our favorite individual sports teams tend to be those we first fell in love with. You write a strong narrative between articles written by a variety of people we know well. It is somewhat unique in its structure because of this. Could you discuss why you chose to do it this way? I struggled with how to tie together the 92 reprinted articles, and finally decided that I needed to provide some context to place each article in perspective. In some cases this might only be a single paragraph, but in others my narrative took up several pages. I tried to keep my writing as objective as possible, and leave the analysis and criticism to the writers of the reprinted stories. The end result is a book that can be read from front to back as a history of the team, rather than just a collection of articles. Alternatively, a reader can look at the table of contents and find enjoyment by skipping back and forth amongst the stories. How long did the book take to complete? About two years. I spent a lot more time than I anticipated in obtaining permission to reprint the various copyrighted articles and photographs. Who is your favorite Viking of all time, and why? It would have to be Bud Grant. He took over a talented, but disorganized team in 1967 and transformed it into one of the NFL’s elite teams. His cold stare from the sidelines at the old Met became the image feared by other teams in the league, and all Vikings coaches since then have been measured against his coaching style and success. With the Brett Favre signing, do you wish you had waited a year before going to press? It would be tempting to wonder what might have happened to book sales if the book were released next summer—after Favre leads the team to the Super Bowl—but back in the real world, Favre’s signing has ignited interest in the Vikings that we haven’t seen for years, and I’ll take that for now. We can always add a supplement to the book for 2010. What is your forecast for the Vikings short and long term success in the NFL? With salary caps and free agency, it is difficult for any team to have continued long-term success, but the Vikings have the defense and running game to be a great team for the next few seasons. Career journeyman quarterback Gus Frerotte was 8-3 last year, and we can hope that Brett Favre should be able to improve on that, even if he can’t match the statistics he had in his prime. Where can our readers buy a copy of your book and when? The book will be available September 1 at major bookstores like Barnes and Noble, Borders, Magers and Quinn, as well at smaller bookstores and on Amazon and other web stores. Vikings fans have often had their hearts broken. Old timers still bitterly recall the four Super Bowl losses, and many younger fans can’t seem to get over the losses in the 1998 and 2000 NFC Championship Games. However, in their 48 years of existence, the Vikings have given us a lot to cheer about. Only Dallas, Miami, Pittsburgh and Oakland have better composite records during those years. Thank you for answering our questions. Good luck, we hope you sell a bunch of copies!